Here are some of the latest match fishing results. 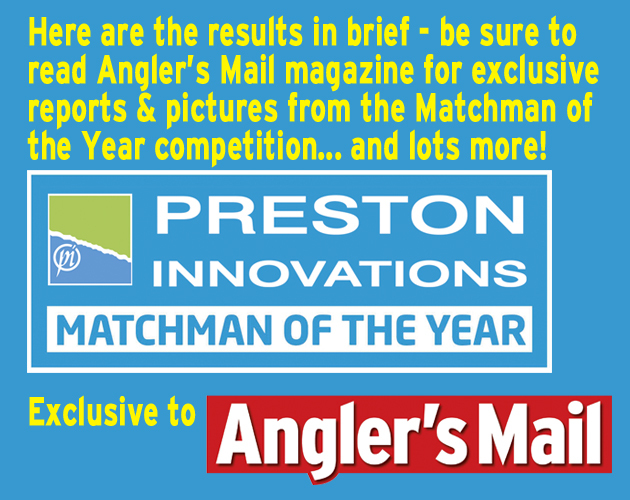 Be sure to read Angler's Mail magazine this week for full latest coverage including the latest monthly winner, selected by Tom Pickering, in the Preston Innovations Matchman of the Year. Bank End, Finningley, S. Yorks. Sun, 15. Ron Wynn (Bank End) 82-1-0, carp, pellet feeder, peg 32; Colin Brown (Doncaster) 38-12-0. Barnburgh Fishery. Doncaster, S. Yorks. Fri, 12, Top Pond. Gary Jubb (Barnburgh) 36-0-0, F1s on poled maggot; Rob Hitchens (Yorkshire Baits) 28-8-0. Sun, 16, Middle Pond. Alan Wadsworth (Barnburgh) 55-0-0, F1s on poled pellet; Rob Hitchens (Yorkshire Baits) 29-7-0; Scott Bufton (Barnburgh) 29-4-0. Beverley, Beverley Canal, East Yorks. Sun, 18. Sean Lesko (Beverley) 4 Kg 650 gr, perch and roach, poled caster, peg 17; Mike Lee (Beverley) 3.250; Barry Sayer (Hull) 2.760. Bradford No.1 AA, Raskelf Pond, North Yorks. Sun, 18. Fred Prudham (Medlock Bridge) 84-0-0, F1s, pellet at 12m, peg 8; Steve Hodson (RSPS DH Angling) 28-0-0; Simon Foster (Bradford No.1) 12-10-0. Carpvale Pools, Moor Monkton, North Yorks. Sun, 20. Dave Wright (Bob-Co) 68-12-0, 13 carp, corn at 14m, peg 18; Gary Miller (Bob-Co) 50-12-0; Andy Gallant (Bob-Co) 48-6-0. Daiwa Hallcroft. Retford, Notts. Mon, 14, veterans, Bridge Outer. Ken Pacey (Gainsborough) 52-2-0, carp, wagglered caster, peg 50; Dave Farr (Sheffield) 27-4-0. Thurs, 28, vets, Moat. Pete Bagshaw (Barnsley Blacks) 92-13-0, carp, groundbait feedered pellet, peg 10 outer; Arnie Payling (Peg One Angling) 86-4-0; Dave Downes (Killamarsh) 49-2-0; Arthur Berisford (Leegem) 42-14-0; P. Ashley (Max Tackle) 42-10-0. Sat, 18. Moat. Sean Cameron (Garbolino) 79-8-0, carp to double-figures, crumb feeder and hair rigged corn, peg 40 island; Arthur Berisford (Leegem) 40-3-0; Gary Mumby (Retford) 35-13-0. Sun, 27. Moat. Mal Edgecombe (Doncaster) 54-12-0, carp to 8 lb, feeder and pellet, peg 40 island; Pete Miles (Doncaster) 49-12-0; Ben Holmes (Matrix Dynamite Trentmen) 44-1-0; John Barningham (Lincoln Whisby) 40-13-0; Steve Twigg (Leegem) 40-10-0. Ferryboat Farm, Conisborough, S. Yorks. Sun, 8. Steve Foster (Ferryboat) 9-2-0, silvers on poled maggot. None Go Bye Farm, Otley, West Yorks. Sun, 20, Middle Pond. Tim Peters (Tri-Cast Calder) 6-10-0, skimmers and roach, poled caster, peg 14; Chris Kendall (Middy) 6-0-0; Ian Sutcliffe (Tri-Cast Calder) 5-7-0. Oaks, Sessay, North Yorks. Thurs, 17, Cedar Lake. Dean Smith (Bait-Tech) 33-5-0, F1s, poled pellet, peg 10; Rob Minikin (Sonubaits) 32-7-0; Ian Bayley (Woodlands Tackle) 31-14-0. Sat, 10, Cedar. Rob Minikin (Sonubaits) 77-10-0, F1s, poled pellet, peg 4. Sun, 24, Ash, Beech and Sycamore. Dean Smith (Bait-Tech) 60-9-0, carp to 3 lb, waggler and maggot, Ash 2; Chris Hall (Oaks) 50-0-0; George Barby (Oaks) 39-3-0. Old Bank, Battyford Canal, Mirfield, West Yorks. Sat, 15. Neil Burland (Tri-Cast Calder) 7-1-0, roach and perch, caster at 12m, peg 3; Chris Lees (Calder Angling) 6-14-0; Stu Campbell (Matrix Halifax) 6-13-0. Phoenix and Parkgate, Ravenfield Ponds, Rotherham, S. Yorks. Sat, 16. Trev Parkin 12-7-0, skimmers, groundbait feeder and maggot, peg 73 dam wall; Dave Griffiths 7-3-0; Don Senior 5-8-0 (all Phoenix and Parkgate). Thornhill, Calder and Hebble Canal, Dewsbury, West Yorks. Sat, 15. Mick Sharpe (Thornhill) 3-5-0, silvers, poled caster and pinkie; Daz Kershaw (Matrix Halifax) 3-4-0; Luke Wrzosek (Dino Floats) 2-2-0. Wakefield, Calder and Hebble Navigation, Calder Grove, West Yorks, Sun, 20. John Wrzosek (Wakefield) 6-7-0, roach, perch and skimmers, poled worm and caster, peg 15; Lee Simpson (Tri-Cast Calder) 5-9-0; Ray Reah (Wakefield) 5-4-0. Winterton, River Ancholme, Cake Mills, Brigg, N. Lincs. Sat, 25. John Boyko (Winterton) 28-0-0, five tench and a bream, poled worm at 6 and 12m, peg 15; Mick Storey (Scunthorpe Tackle) 17-10-0; Col Batchelor (Scunthorpe Tackle) 13-2-0; Graham Bontoft (Scunthorpe Tackle) 10-6-0. Yarm, River Tees, Yarm, Cleveland. Sun, 23. Tony Leeming (Yarm) 6-1-0, skimmers and roach, pole feeder and worm, peg 173; Richie Bezemer (Daiwa Cleveland Angling Centre) 4-14-0; Stuart Bell (Maver Newman Scotts) 3-10-0.